-- only reminds me how different these pages were in person, when I could use my thumbnail to gently turn the wheels against each other, or wiggle the surprisingly sturdy thread contraption holding it all together. I don't mean to fetishize the book. But, as our research increasingly relies on facsimiles -- from fac simile, literally "to make similar" -- it's worth asking: what gets lost in the digital archive? What is flattened on the screen? 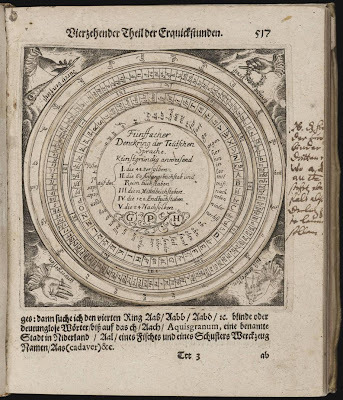 -- or simply depict certain beliefs about language, as Georg Philipp Harsdörffer does in his Fünffacher Denckring der Teutschen Sprache (1651, pictured above), used to automatically generate German words. We see digital archives, faceted browsing and visualizations as having a certain depth -- you can zoom in, we say, or drill down -- yet, ironically, depth is precisely what is lost when we re-frame the printed page as a digital image. We should interrogate how the digital archive is mediating our relationship to the objects we study with as much vigorousness as we argue over how writing transformed oral culture, or how print transformed scribal culture. Will the digital archive reinforce our often misguided notions about the fixity of print, or the flatness of the page? 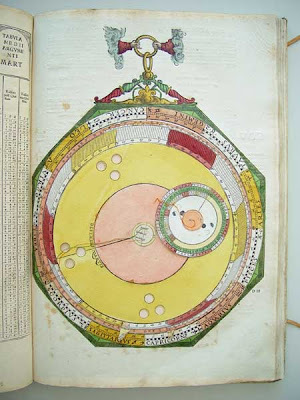 What would the study of volvelles or book flaps look like in a digital space? Last year, HyperStudio sponsored an talk entitled "Harlequin Meets The Sims," by Jaqueline Reid-Walsh. Reid-Walsh has done fascinating research on the history of children's interactive narrative media, digging up paper doll games, puzzles, and flap books from the eighteenth and nineteenth centuries. 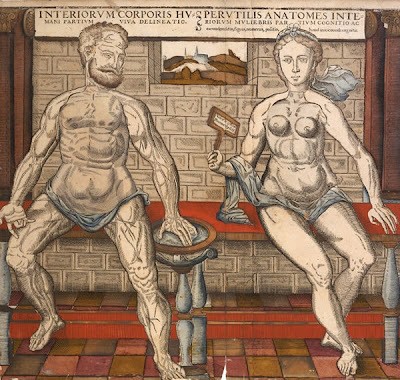 Because the materials she works with are fragile and little-known, she's turned to digital humanities labs like HyperStudio to digitize and display the materials. The only problem: no one has come up with a good digital solution for capturing what it feels like to cut out and play with paper dolls, or flip the page of a pop-up book to reveal a small paper universe. And, of course, we never will. The British Library's Turning Pages technology is neat, but paper is not a screen, and a screen is not paper. 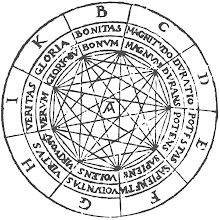 Instead of trying to "recreate" these experiences in a virtual space, thereby pretending there's a one-to-one correspondence between the two technologies, we should build on the digital archive's strengths (broader access to rare materials, smart searches, the ability to manipulate and annotate the facsimile without destroying the original), and be honest about its possible weaknesses -- what it elides, and how it frames the book.